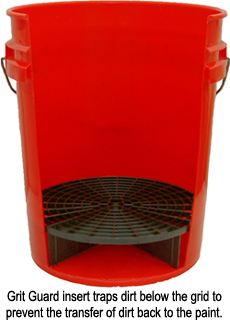 The swirl-preventing bucket system including the Grit Guard and Gamma Seal lid! The 5 Gallon Grit Guard Wash Bucket Combo includes the swirl-preventing bucket system and the Gamma Seal Lid. Just add your favorite lubricating car shampoo and you’ve got the makings of a safe, swirl-free wash. 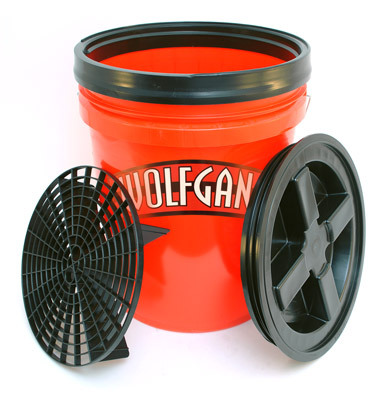 The Autogeek 5 Gallon Wash Bucket Combo includes the revolutionary Grit Guard Insert, a radial grid that traps dirt at the bottom of the wash bucket. It serves as a wash board to agitate and release dirt from the mitt. This process prevents dirt removed from the paint from transferring back to the vehicle from the dirty wash water. This smart system improves your odds of washing your vehicle without producing swirls. This big bucket is perfect for washing your vehicle, boat, RV, or ATV. Since many premium shampoos, like Pinnacle Bodywork Shampoo, call for one ounce per 3-4 gallons of water, you need a large bucket to get the proper ratio. The bucket is also perfect for transporting and organizing detailing tools. You can fit a lot of supplies in a 5 gallon bucket! The system includes a lid for the 5 gallon bucket. This isn’t like a recycled paint bucket – this lid forms a watertight seal. You can fill the bucket with water and transport it without the lid leaking! For car collectors who participate in car shows, this is a great feature. Believe it or not, some of these enthusiasts use nothing but distilled water on their vehicles and they’ll actually bring it to the car show if it’s not available on site. That’s dedication! Protect your vehicle from wash-induced swirls with the Autogeek 5 Gallon Wash Bucket Combo. The Grit Guard Insert and the Gamma Seal Lid make this the most functional wash bucket you can buy. Please call for a shipping rate quote for expedited service. I love the product and how well it cleans the debris out of my microfiber cloth. After over a years usages I noticed water leaking from outside the bucket. Upon inspection the bucket had a split from the inside to out. The edges of the grit guard had pushed up on the sides of the bucket causing it to split over time. I ended up sanding down the edges on the outside ring of the grit guard to take away the high points that were putting pressure on the bucket. Time for a new bucket. Great idea for trapping the sand and dirt away from brushes and cloths. THIS IS A GREAT BUCKET, THE LID COMES IN HANDY IN MANY WAYS I KEEP SOME CLEANERS IN SIDE AND I CAN USE AS A SEAT. Quality construction (bucket, lid, and dirt collection insert). I am giving one as a gift to my brother.